A fun closed-room space ship murder mystery featuring ….. ta-da …. clones! 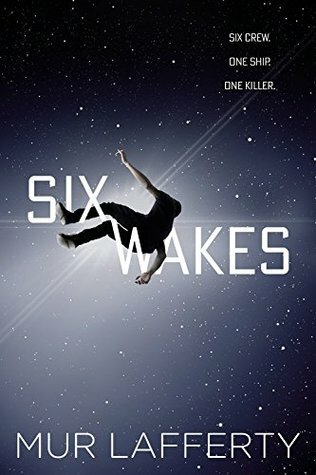 The six person crew of a generational ship on it’s way to a distant planet, its hold containing 2000 sleeping bodies, and a bunch of mindmaps in a special computer, are abruptly pulled out of their cloning vats to discover they were all murdered. And to prove it, there were their previous bodies, ripe with evidence and bleeding horrifically. 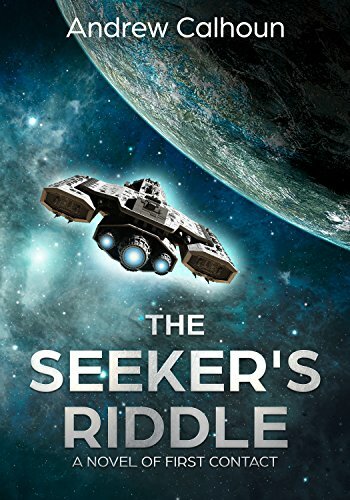 The ship, a-sail for twenty five years now, has suddenly been hacked, sabotaged, the AI running the behemoth (about 3 miles long) not working, and the course has been altered, the ship is slowing down and off its original course. Interesting ideas about cloning. In this future time, cloning is for basically eternal life, not for multiplying oneself. You can only have one clone going at a time, and you have to be dead. You can, however, leave your estate to your cloneself, so you can see how this could be real popular. It brings up the issues of the value of life, because if you can die and wake up tomorrow as your 20-year-old self, there is no thrill too dangerous, no drug too toxic, etc., etc. The six crew members were all criminals with prison time awaiting them, or currently serving it, when they were offered the opportunity to crew this ship, with their records expunged at journey’s end and a new life awaiting them. 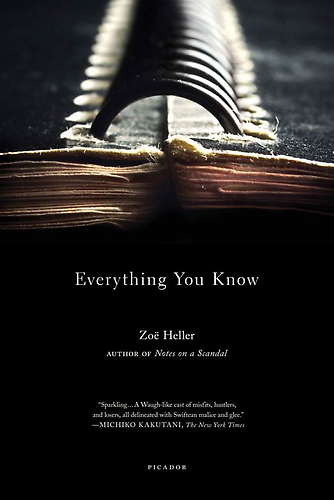 But in order to find out what has happened, and who dunnit, which none of them have any memory of, they must discover what connects them all, and what secrets each is hiding. Great mystery. Kind of light on the sci aspect of the sci fi, and heavy on the cloning ideas, so don’t ask too many questions about how this approximately 100 year journey is being accomplished, and how an AI runs a ship. No astro physics but lots of philosophizing. I loved it. 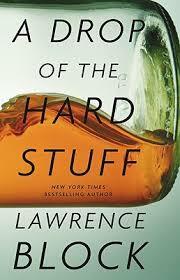 It got a Hugo nomination, but frankly, much as I liked it, didn’t quite seem Hugo-quality, but what do I know? Anyway, mystery, space, clones. What’s not to like? George Gissing was an English novelist who published 23 novels between 1880 and 1903. He was more popular in his later years, and his early work was not considered a resounding success. However, here it is, 2018, and he is still being read. His work focuses on the class issue, commercialism, and the themes of love and loyalty. 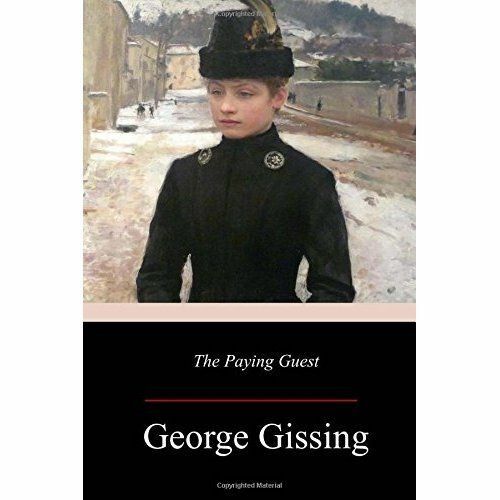 The Paying Guest is a novella, and concerns a young British couple whom we would consider middle class today, but keep in mind, in spite of being what we would think of as middle class, they had a nanny and a maid/cook. They live in something of a suburb of London, and the husband works in the city. The husband, thinking to improve their finances, sees an ad in the newspaper from a young woman looking for a home in which she could live as a paying guest. He offers the suggestion to his wife that if the young woman is suitable and the two women get along, it might be a way to earn a little more income. The young woman arrives, and although claiming she has had 200 responses to her ad, chooses them with whom to stay. She wishes to escape her lower class home, and although her step father is kind and generous, she feels he somewhat prefers his own daughter from a previous marriage. The plot revolves around the young woman’s attempts to make a suitable marriage by playing off two interested men against each other, one of whom is the soon-to-be-betrothed of her step sister. All of her machinations bring a lot of silly trouble to both her family and the people she is staying with, and all in all, would probably make a decent sit com episode in today’s world. The book is filled with who is superior to whom, who can ‘receive’ whom, who is beneath whom, and just what few options a young woman has in the England of the late 1880s, marriage to someone who can support her being the option of choice. Sweet novella length book, and good enough to make me want to give his more popular books a shot to see if they hold my interest in a longer version. This is the second of the Broken World trilogy, and it is every bit as good as the first. I have found that trilogy-reading can be dicey. Usually, the first is great, the second is pretty good, and the third is meh. Not always, but often enough for me not to get my hopes up. Well, raise the hope flag, kiddies, because The Obelisk Gate is another page turner. It continues the story of Damalya/Syenite/Essun, as she travels on to find her daughter, Nessum. In the world of the Stillness, earthquakes occur with such devastating frequency that their aftermath is called a Fifth Season: a season of ashy skies, boiled oceans, fauna and flora that change their behavior in accordance with the vicious atmosphere. The world has lasted this long because of orogenes, people born with the ability to manipulate thermodynamics such that they can quell shakes and divert disaster. But orogenes are a feared and oppressed minority among the so-called stills, kept in check by Guardians who can resist and disrupt their power. We now see Essun — who was Syenite, who was Damaya — living underground in a strange crystal-ridden community called Castrima. Essun had been taken in by a community that at least nominally accepted roggas (as orogenes are called, derisively.) The community lives in a geode deep in the earth, a structure undoubtedly of ancient and occult origin. She and her traveling companions—a boy who is not a child, and a woman who has strange talents of her own—attempt to fit in, to grieve and survive this bleak new world. Essen also finds someone from her past: a teacher of sorts, a lover, the strongest orogene in the world. The man who broke the world as it broke him. , learning that her old friend, mentor and lover, Alabaster — the most powerful orogene in the Stillness — is responsible for the current Season. Drawing power from the incomprehensible obelisks that float in the skies, he tore the continent apart trying to use their power to break the sick social order and begin the enormous work of ending the terrible cycle of Seasons. He is trying to bring the moon back into orbit, from which it was flung eons ago. But the cost of using the obelisks is high. Alabaster is slowly turning into stone, and Essun needs to learn all she can from him if she’s to complete the work he began, and end the Seasons once and for all. 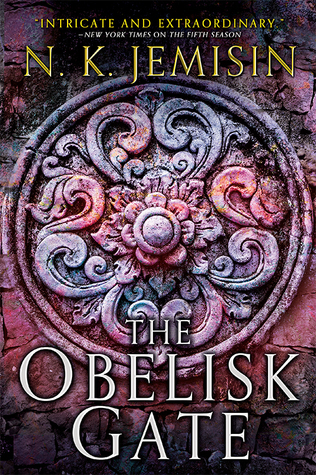 The Obelisk Gate won the Hugo Award for Best Novel in 2016, and The Fifth Season won the Hugo Award for Best Novel in 2015. Willy Muller is a 55-year-old antihero, a hack journalist, absent father, convicted murderer, and all-around jerk who must come to terms with his past when his teenage daughter Sadie commits suicide. Muller became estranged from Sadie and her older sister, Sophie, when he was imprisoned for murdering his wife and their mother, Oona. After being released on appeal, out of a job and desperate for cash, Muller wrote To Have and To Hold, a lurid confessional novel about his marriage and his wife’s death. The book’s publication earned him the scorn of friends and family, and Muller fled England for Los Angeles, leaving his two rebellious, emotionally damaged teenage daughters and pursuing a life of feeble ghostwriting and shallow society. The novel opens with Muller recuperating from a heart attack and reevaluating his life with the help of a box of Sadie’s diaries, sent to him after her death. Reading the words of his ill-fated daughter, he can no longer deceive himself about his sorry behavior. Sounds like a real downer, right? Well, yes and no. You can get annoyed at the whiny, entitled tone of Willy, but all the time you know that he knows that he is a sh*t, and that even if he feels sorry for himself, he also feels he deserves it. Willy is Everyman, really. Some good, some bad, some neurotic, some introspective, some self-delusional, some honest with oneself. Yeah, we think we know everything, don’t we. We each of us thinks we always know best. And sometimes we do and sometimes we don’t. Come to me, I’m the man with the blues. This is the last of the Matthew Scudder detective series. 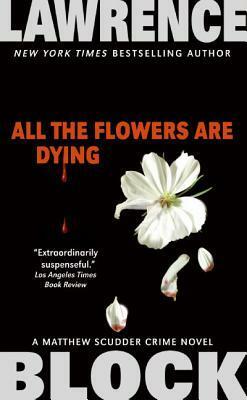 I disliked the previous two because of the unwanted sections giving the viewpoint of the serial killer. But in what may be the final Scudder book, we are back to old times, old style. Scudder is now in his sixties, still sober, still married to Elaine, and sitting around with his old friend and criminal, Mick, who has now married the daughter of the folks murdered two books ago. He has also cut way back on the drink, some days not drinking at all. As the two get to reminiscing, Scudder remembers old High-Low Jack, Jack Ellery. They were in grammar school together for a couple of years before Scudder’s family moved, and ran into each other a couple of times since, with Matt having joined the police force, and Jack having taken a criminal route. But when they meet once again, about a year after Matt is sober, it is at an AA meeting, and Jack has been sober longer than Matt, a couple of years at least. He is working the Steps, the twelve steps of the program which have been created to help a person get sober and remain sober. He is working on the 8th and 9th steps, where one lists all those one has harmed by one’s drinking, and in the 9th step, goes to each one to make amends. He is found one day in his rooming house room, shot twice, once in the mouth, and it is not suicide, unless you consider him a very determined person. The police have nothing, and the case goes cold, but Jack’s sponsor has a dilemma which he discusses with Matt. He has the list of persons harmed written by Jack, and if he turns it over to the police, they could involve a lot of innocent people with dicey backgrounds. If he doesn’t turn over the list, perhaps the killer is among those on the list and will go free. He asks Scudder to investigate the people on the list in order to clear them. And it looks like everyone on the list is clear. And then some of them start turning up dead, one as an apparent victim of a murder, and one an apparent suicide. Great mystery, really well done, and the case solved by Scudder’s now legendary tenacity and inability to let go. Somewhere along the way he’d returned his bottle to the back bar and came back with a liter of Evian water. And there we sat, two old men up past our bedtime, talking and drinking water. I might try some of his other series. He is a prolific writer with a style I enjoy. A seventeen-year-old kid from Corpus Christi in the Southern Union, an insular and backward-looking area of the country (world? not sure), wants out. He is obsessed with space, and astrophysics. It is the 23rd century, and citizens of the SU are not accepted into top universities in other areas because their education is so backward. Locke Howden and his ten-year-old sister are orphans, living off the charity of their housemates. He figures if he gets a job mining asteroids on a three-year hitch, then goes to a decent university, he will finally be able to return to Earth and get his sister for a decent life elsewhere. On the elevator vehicle to the space station transportation center, he meets a young woman pilot and her autistic brother who is continually tapping something. Bullies enter the room, and do bullying things, Locke intervenes, and the sister is grateful. He eventually figures out that the young autistic man is tapping out some mathematical equations. They reach the space station and board their transport to the outer fringes of the galaxy, but help! The ship is boarded by pirates, and the sister, the brother and Locke are kidnapped and taken to an heretofore undiscovered planet. Fortunately, this planet is like earth with gravity, biosphere, atmosphere, and all that. What is also on the planet is a downed HUGE spaceship. The planet is the headquarters for the pirates, and they want to get into that spaceship but it apparently still has internal power, and the security system won’t allow them in. In fact, there is a vestibule which has a wall containing a puzzle which must be solved in order to get into the rest of the ship. Turns out the pirates are ‘hacked androids’ — human brains and consciousness in an android human-like body, and the ship won’t let them even near it. But the planet also has a community of human farmers, and the ship will allow the humans into the vestibule. But nobody can solve that puzzle. The autistic brother is actually a savant, with some extraordinary knowledge, and the pirates kidnap him hoping he will be able to solve that puzzle and get them inside the ship. All very space opera-y and fun, and filled with some interesting ideas. But there were some things that kind of took it out of the A+ category for me. First of all, not sure why the protagonist was a 17 year old boy. It didn’t quite work for me, seems like it should have been a young twenties person. Second of all, and most annoying, even though the time is the 23rd century, the book is filled with current, and not only current to 2018, but current to mid-20th century’s slang and phrases and references. Like when a character who is in a hurry quotes Frost: “I’m afraid I’ve got promises to keep, and miles to go before I sleep.” Really? Folks would still be quoting a somewhat minor American poet of the twentieth century in the twenty-third century? naaaaaah. And lots of tired old cliches, which are tired old cliches even now, like “avoid like the plague”. Stuff like that. It put me off. This is billed as a First Contact novel, so I am not letting the alien out of the bag if I tell you that, yeah, there were aliens, the main spokesalien of which seemed a pretty jazzy hipster, which also struck an odd note. I can go with the alien speaking English using one of the character’ brains and body, but it seems just a little far-fetched that it would be so culturally attuned in his attitude and speech. Well, culturally attuned, that is, to the twenty-first century American culture. But anyway, as I said, it was fun, and hey, aliens! Right? Nifty weapons. A boots-on-the-ground battle. The good guys win, the bad guys go to android heaven, and the rest who have a righteous mission to save the rest of their android brethern and sisteren from slavery, go and do just that. The sixteenth Matthew Scudder NYC detective series. Hated it. It features that same serial killer from the last book, and once again we have the sections told from the perspective of the serial killer and pfffft, stop, just stop doing that. Scudder is 62 years old now, prosperous, semi-to-mostly retired, the book has lost its late 1900s gritty noir feel, he doesn’t live in that hotel room any more, he still goes to AA meetings, and basically, the entire trope feels tired and like the author has gotten thoroughly sick of Scudder and this series. There is a small side mystery which he solves, but nah. Oh, well, all good things must come to an end. There is one more in the series which looks a lot more interesting, so I will read that just to say I read the whole series.